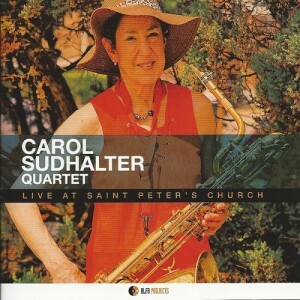 A pioneering woman in jazz, Carol Sudhalter has, since the early 1970s, been advancing the cause of women in jazz as a musician (she is among the finest baritone saxophonists of the past several decades but also quite accomplished on tenor sax and flute), big band and combo leader, producer, and educator. She played with the first female Latin band and founded the Astoria Big Band (still active for 33 years). She had a discography of over ten albums to which this new release, recorded at a performance at New York’s famed St. Peters Church is a welcome addition. She is backed by a tight quartet that includes Patrick Poladian-piano, Kevin Hailey-upright bass, and Mike Campenni-drums and they perform fresh renditions of songs by Jobim, Sonny Rollins, Benny Golson, Tadd Dameron, Bill Evans, Hank Mob- ley, Don Redman and two originals. The opening ren- dition of Tadd Dameron’s “On a Misty Night” quickly establishes the authority and inventiveness she brings to the baritone sax with her robust, brawny attack while the backing trio provides strong support throughout this swinging, modern jazz set. There is a haunting Benny Golson ballad “Park Avenue Petite” that exhibits her emotional range on the baritone sax while Hailey contributes a melodically grounded solo. There is a lovely flute solo on Bill Ev- ans’ “Time Remembered.” There is a bit of swagger to her playing on Hank Mobley’s “Funk in Deep Freeze” along with some stunning piano which leads into a crisp drum solo. You are currently browsing the Carol Sudhalter blog archives for the day Saturday, March 16th, 2019.